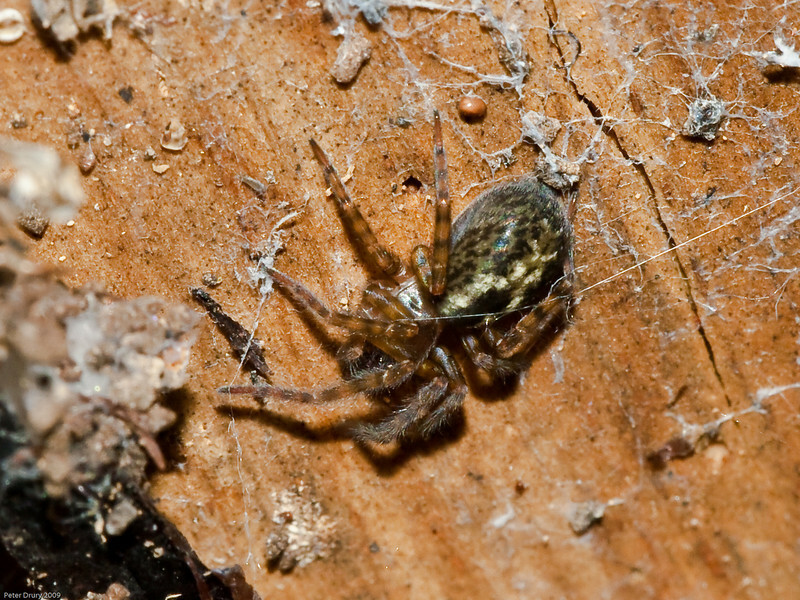 Lace webbed spiders vary in body size from 7 mm to 12 mm, with large, strong legs. This spider has a close relative called A. similis which tends to be larger and darker in colouration when an adult, and prefers the indoors. The smaller, lighter A. fenestralis is rarely found inside, and is often observed on outside walls, or on trees, especially under loose bark. Both species have V-shaped markings on their abdomens, with A. fenestralis having two or three of these, and A. similis usually having four. For precise identification, spider genitalia may need to be checked for characteristic differences in the species. All members of the family Amaurobiidae are nocturnal, and their bluish silk, woven into a funnel, is combed into a frayed texture with a calamistrum, a row of stiff hairs on the rear legs. Much like Velcro, the barbed hooks of insects get caught in the furry web, allowing the catching of much larger prey than the spider itself. Around the second year of life, Amaurobiidae spiders lay an average of 40 eggs in a breeding chamber spun of silk, where the mother will protect the eggs until hatching. When the young are born, they will consume their egg yolk, and then devour their mother before emerging from the chamber.